Students Walk Out Again To Protest Gun Violence Thousands of students are expected to walk out of school on Friday to protest school violence. It comes on the 19th anniversary of the Columbine shooting. Thousands of students are expected to walk out of school on Friday to protest school violence. It comes on the 19th anniversary of the Columbine shooting. Thousands of students are expected to walk out of their classrooms this morning in protest over gun violence. 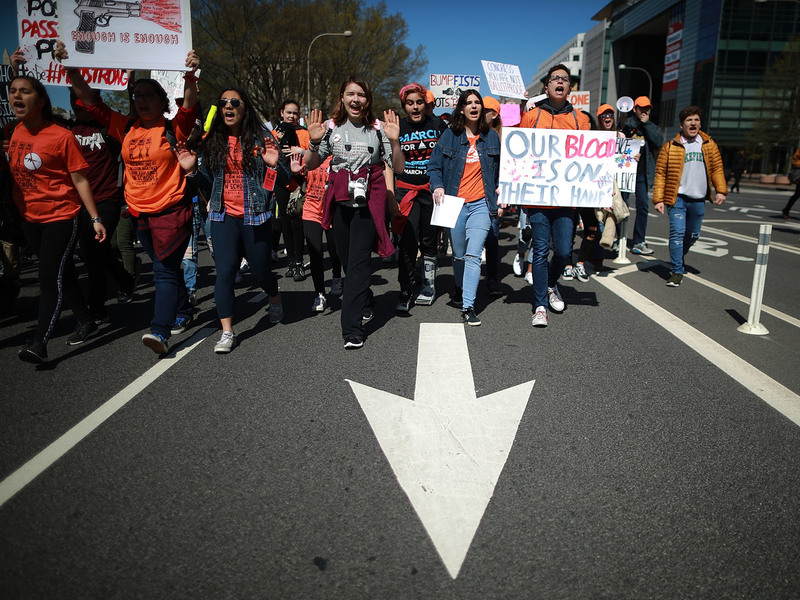 It's the third major student-led demonstrations since the shooting that killed 17 people at Marjory Stoneman Douglas High School in Parkland, Fla. That shooting sparked a national debate about school safety and changes to gun laws. Today marks 19 years since the mass shooting at Columbine High School in Littleton, Colo. The students who are protesting today won't remember Columbine because they weren't even born yet. NPR's David Schaper is following this story from Chicago and joins us now. So, David, what's this walkout today going to look like? DAVID SCHAPER, BYLINE: Well, it depends on where you're at. The levels of participation are going to vary quite a bit. First of all, in suburban Denver, Columbine High School will be closed, as it has been every year since that shooting in 1999. And students there will participate in a day of service, as they have done in many years. It's become the tradition there. Elsewhere around the country, participation levels, as I said, is going to vary. There's not nearly as many schools here in the Chicago area that are actively participating as did so back on March 14. That was the event to honor the victims of the Parkland shooting, mostly. Some schools in this area are even warning students and parents that there may be disciplinary action for students who walk out today. In the city itself, though, there are students at several area high schools who plan to walk out and meet up for a rally downtown later in the day. And I checked in with one elementary school that's taking part in its own way. This is Charles Henderson Elementary School in the Englewood neighborhood on the city's South Side. And these are students who go through those lockdown drills like everyone else, but a Parkland or a Sandy Hook-like shooting, that doesn't worry them much because their everyday reality is much more frightening. DION MCGILL: The idea of walking to and from school and getting shot is much more prevalent in the minds of the kids I work with than someone actually coming into the school and shooting. SCHAPER: That's Dion McGill. He's a former teacher who now works for the group Illinois Council Against Handgun Violence, and he implements school-based antiviolence programs for them. Over the past couple of years, he says there have been two students at Henderson who have been shot and killed. One was an eighth-grader who was walking home and shot and killed just a few blocks away. The other was a sixth-grader shot in a schoolyard on a Saturday while hanging out with friends. So today, students in fourth through eighth grades at Henderson Elementary will participate in a neighborhood march and a rally against gun violence. And this is something they've done before, after shootings in the neighborhood in the past. That's taking place at 10 o'clock today, just like all the other marches and rallies around the country, and it will be followed by a community town hall meeting. MARTIN: So as you noted, students have walked out of school before, just earlier in March. And we saw pictures, photos of students from Parkland, Fla., in meetings with lawmakers, lobbying them one on one. Has any of this activism moved the needle, so to speak, when it comes to actually making change and bringing about legislation on gun violence? SCHAPER: Well, I think one change that has been noticed is that this is getting a lot more attention. These students are getting noticed. They're getting those meetings, as you mentioned, on Capitol Hill and in state legislatures all around the country. There hasn't been movement much in the way of new laws, but some state legislatures have been taking action. Illinois is one of them, where lawmakers did pass a bill to license all gun dealers in the state. However, it was vetoed by the state's governor. There's an effort now to override that. There's momentum in other states, too. But while there seems to be a lot of steam behind the movement here, there's a new poll out that we had out this week. The NPR/PBS/Marist poll shows that not even half of Americans say gun policy will be a major factor when they vote. Still, we are seeing this new generation of leaders emerging and making a strong case for change. MARTIN: NPR's David Schaper in Chicago. Thanks, David.